This product was featured in my MeMeBox No. 6, which I showed previously (click >>here<<). 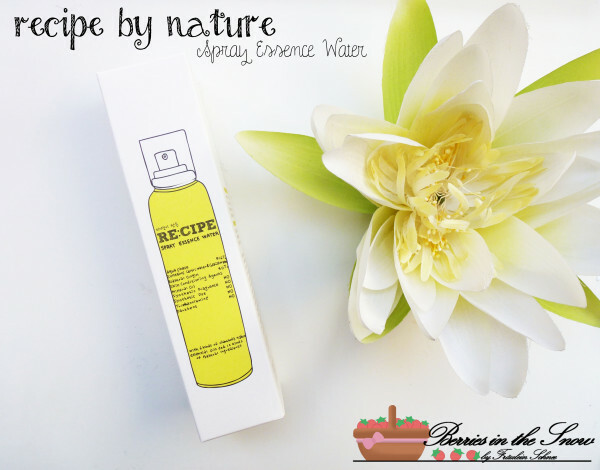 It is a Spray Water Essence from the brand Recipe by Nature. 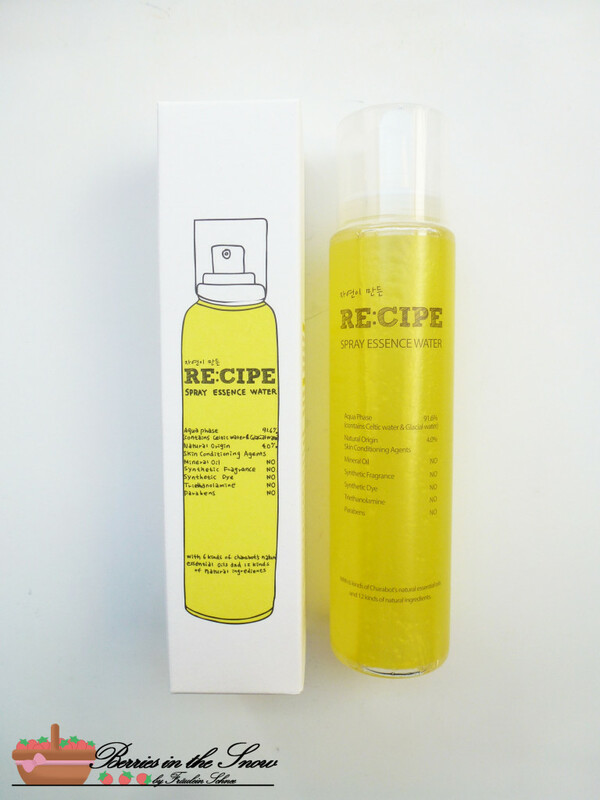 You don’t find a lot of information about this brand on the Internet and honestly I only could find the products sold on MeMeBox shop (English) and on the brands homepage www.recipecosmetics.com, which is in Korean only. Nevertheless, this was the first product out of the box that I tried because I really love the packaging design. As you can see the packaging design is very clean. The card box has a sketch of the spray bottle on it and the colors are yellow and white. The box only comes with Korean description unfortunately, except on the front part (click the image below to enlarge if you can read Korean and are interested) . It is a water spray containing additionally to water a bunch of different natural oils as you can see in the ingredient list. It is 8-free, which means that it doesn’t contain 8 unwanted ingredients like mineral oil, synthetic fragrances synthetic dye, triethanolamine or parabens. The front of the packaging also says, that it has a water phase of 91.6 %, containing celtic water and glacial water and 4 % natural origin skin conditioning agents. The other percentages must be from the PEGs and alcohol derivates. It contains all in all 6 kinds of Charabot’s natural essential oils and 12 kinds of natural ingredients (Charabot is a company providing essential oils for the perfumes) . If you go to the product page >>here<< you will find some illustrations on the ingredients. Since it also contains oil you need to shake it before use, you’ll see how the two layers will separate and form tiny droplets within the bottle. The actual spray bottle looks like the sketch on the packaging. The bottle is made of sturdy see-through plastic, so you can say how much is left in the bottle. The cap is transparent and protects the spraying nozzle. When you use it it provides your face/skin with a pleasant drizzle. The spaying plus the light citrus/herbal scent makes it feel very refreshing while using. I used this as a toner as first step of my routine and it goes well with other products. It doesn’t make the skin look greasy at all and it is nicely moisturizing. All in all, this is a nice toner and mist. I will surely be sad when I used this up, especially since MeMeBox stops shipping internationally at the end of this month. also, I’d love to try other products from this brand, but I couldn’t find any other shop selling these. You can buy the 140 ml bottle at www.memebox.com for US$ 9.00 (additional shipping costs will occur). I love facial sprays and this looks amazing! The price is pretty decent too. It’s one of my favourites at the moment. It feels so refreshing and I really love the scent. I want buy a memebox and they don´t ship to my country, I saw this product before and others memebox reviews and looks excellent! Thanks for your review! Yes, I’m really sad that they stop shipping to european countries from now on. Luckily I ordered a couple of boxes before the deadline enden and I’m looking forward to review these aswell. this product looks amazing! I am just about out of my LUSH Roma Water face spray mist, I may have to look into this one! Thanks for the review! Looks great. I also love the packaging. The packaging is really pretty. I’m really happy about this product. Thanks for commenting!